The All-New Kona Electric is a car of no compromise, combining Hyundai’s progressive SUV style and a zero-emission electric powertrain. 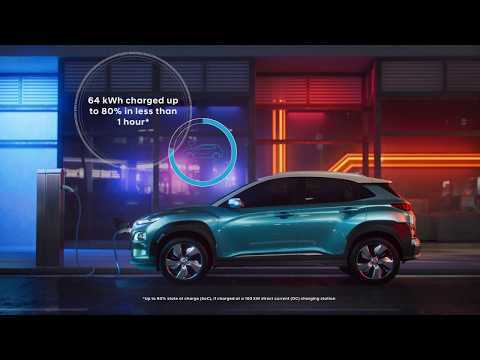 With the launch of the All-New Kona Electric, Hyundai Motor is offering the first fully-electric subcompact SUV on the European market. The new model in Hyundai’s eco line-up is available with two different powertrain versions, offering an outstanding range of up to 300 miles. Hyundai's first, fully-electric subcompact SUV features a unique exterior design with closed grille and a dedicated centre console in the interior for intuitive operation of the shift-by-wire gear control, carrying the same expressive design as the regular Kona. The All-New Kona Electric features two different powertrain versions, offering customers one of the most powerful electric motors. The long-range battery version provides driving range of up to 292 miles*, delivering a maximum output of 204 PS (150 kW). With a battery capacity of 39,2 kWh, the basic version drives up to * on a single charge with the motor delivering 135PS (99 kW). With 395 Nm of immediate torque and an acceleration of 7.6 seconds from 0 to 100 km/h, the All-New Kona Electric provides a fun-to-drive experience.